SearchResearch Challenge (9/14/16): What IS that below? ... and you know what happens... I tend to look out the window and gaze at the land and sea passing by below. I often end up wondering--What IS that thing I see below me? This week I present a few mysteries--things I've seen, things I've heard about that are visible from the air, things I've wondered about as I travel. Can you help me figure out what's going on with each of these? The Farallons up close. Can you see them from the mainland? 2. I've heard stories about a series of large, strange arrows that are on the ground. Apparently, they're made of concrete, or cement, or stone. In fact, I've seen one (and had no idea what I was looking at) while flying in the southwest of the US. Do these things really exist? Can you find a picture of one? Who would make these things, and why? What's the story here? 4. The Caribbean seems to be full of islands that are just slightly off the map. While flying there a few years ago, I remember seeing an island just east of Jamaica and west of Haiti. From the air, it looked like a perfect pirate hangout place--remote and mysterious. What is the name of this island? It also looked like a great place to put a lighthouse--is there one there? Where is it on the island? These are fun Challenges that will doubtlessly lead you onto doing a bit more research on travel-related topics. Have fun with these, and let us know what you find (and HOW you found the answers). I'm about to head off for a couple weeks of travel myself. As you might guess, some of what I find will probably end up here in a future SearchResearch Challenge or two. I'll be back here on October 3rd with a few answers and a pile of new Challenges. See you next month! 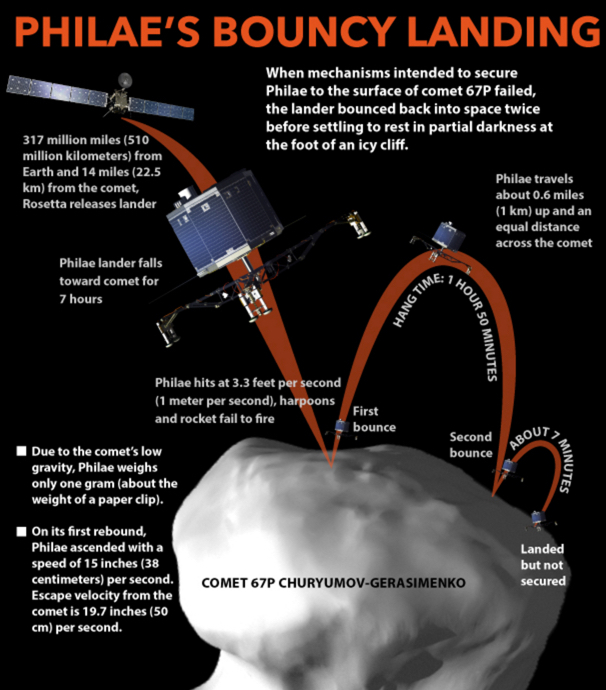 You might recall the Challenge we had in April 2014 about Comet 67P/Churyumov-Gerasimenko, Philae and Rosetta. Back then we wondered about how hard the comet was, and how difficult it would be to land Philae, the descent-lander on the surface. We found out that it was harder than we thought. ESA's (European Space Agency) Philae lander touched down Nov. 12, 2014 and then bounced a couple of times before landing and attaching itself to the comet's surface. But its final location was uncertain. But it finally landed and stuck... but in a crevice without much light. It ran on batteries for about 60 hours, sending back data (via the mothership Rosetta, orbiting above) before going into sleep mode. 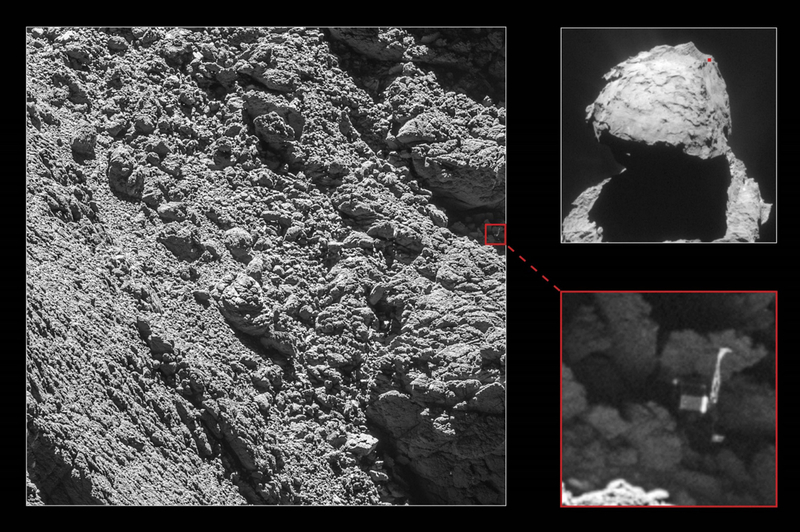 Still, without visual verification (and no handy EXIF metadata giving us the lat/long on the comet), nobody knew quite where Philae sat on the surface. On September 4, Rosetta managed to get a good image of Philae... and yes, it's wedged in a shadowy crack on the surface. I'm also going to be taking a short break--an actual vacation that will be (mostly) internet and Wifi-free. My goal for the next two weeks is to NOT spend time searching for much of anything other than clear blue water and sandy beaches. In full Philae mode, I'm taking a bit of time off, and will be looking for sunshine to recharge my batteries. Searching (for azure seas) on! Answer: How do you make sense of obscure technobabble? I'm interested in how much people understand the world around them, and in particular, how much they understand about what they read. How do we learn about how the world works? One important way is by incidental learning, or by things you pick up along-the-way, not while engaged in any focused educational activity. Sign in a local gym. 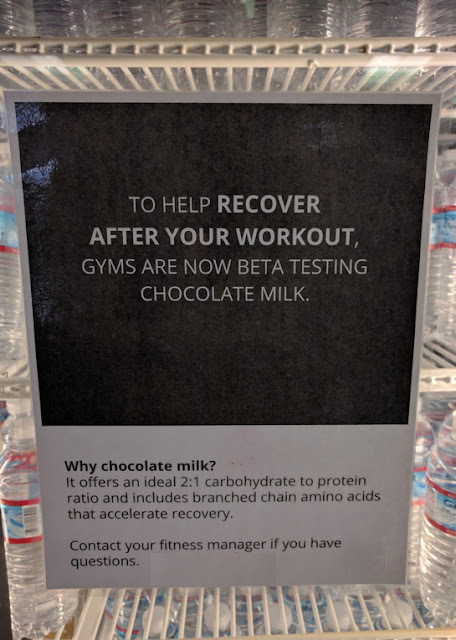 First off, this is a complex bit of prose--too complicated for what it's trying to tell you (which is, basically, "chocolate milk helps you recover after a workout"), but it also is cast in a very technobabblish sort of way ("2:1 carbohydrate to protein ratio" and "branched amino acids"). As I said, I think I'm a fairly literate person, and yet when I read this, I have no idea if it's true, or just bafflegab. The thing is, we all see texts like this all the time: sales pitches that are trying to convince us of ideas ("drink chocolate milk, it will help you after your workout"). The thing is, you're ALSO implicitly learning that there ARE such things as "branched chain amino acids" and that they're somehow good for post-workout recovery. You know that 99 people out of 100 will read this and start to believe that "chocolate milk really does accelerate recovery" and that a "2:1 ratio of carbos to protein is an ideal ratio." Here I'm trying to see if anything has been written on what ratios have been studied (or at least written about). Note that I purposefully did NOT include the 2:1 (or "2 to 1" or "two to one ratio") in my search--doing so would bias the results towards results that discuss exactly that ratio. For all I know at this point, maybe the ratio is unimportant, or that a 10:1 ratio would be even better... so I just left it out, hoping to learn something from what I read. These results are better, especially since they're all about athletic performance, but still, they're mostly about how to set up your (athletic) diet. A few clicks in this SERP, and I found that the original article was in International Journal of Sports Nutrition. Now we're getting somewhere! Let's try to find the original report about the chocolate milk effect. How can I do that? Since it's a scholarly journal, I'm going to turn to Scholar. Nine male, endurance-trained cyclists performed an interval workout followed by 4 h of recovery, and a subsequent endurance trial to exhaustion at 70% VO2 max, on three separate days. Immediately following the first exercise bout and 2 hours of recovery, subjects drank isovolumic amounts of chocolate milk, fluid replacement drink (FR), or carbohydrate replacement drink (CR), in a single-blind, randomized design. Carbohydrate content was equivalent for chocolate milk and CR. Time to exhaustion (TTE), average heart rate (HR), rating of perceived exertion (RPE), and total work (WT) for the endurance exercise were compared between trials. TTE and WT were significantly greater for chocolate milk and FR trials compared to CR trial. The results of this study suggest that chocolate milk is an effective recovery aid between two exhausting exercise bouts. First off, this is a tough study for the poor cyclists. They tested the athletes by first having them workout to exhaustion, wait for four hours while drinking various fluids, then workout again to exhaustion. This isn't just "I'm tired," but is exhaustion, which is when you're literally unable to do any more work. It's fairly unpleasant, but these 20-something year-old (all male) Indiana University students did in the service of science. The good news: The results are pretty positive. Bottom line: By this study, chocolate milk works just ever-so-slightly better than Gatorade, and a lot better than a carbo-replacement fluid. You can read the paper (and all of the ones that follow-up on this) to figure out why, but now we know where this story began--with a study about chocolate milk vs. Gatorade vs. a carbo-drink. NOW, let's pop back to our topic: What about those "branched-chain amino acids"? Wikipedia tells us that: "A branched-chain amino acid (BCAA) is an amino acid having aliphatic side-chains with a branch (a central carbon atom bound to three or more carbon atoms). Among the proteinogenic amino acids, there are three BCAAs: leucine, isoleucine and valine..."
and found a few articles, e.g., this one on "Branched-chain amino acid supplementation does not enhance athletic performance but affects muscle recovery and the immune system." (J Sports Med Phys Fitness. 2008 Sep;48(3):347-51) that suggests that BCAA actually DOES aid in post-workout muscle recovery. If you think about it for a minute, plain old milk has the BCAAs that work to improve post-workout recovery, while the chocolate provides the carbohydrates. Or, if you don't want regular old sugar, eat a small banana and you'll get the same effect. Bottom Line: The bafflegab seems to be correct, if a little difficult to read. But the really good news is that it's true that the amino acids from milk are proteingenic, and do help your muscles recover. And getting that little bit of carbos into your system right after working out DOES help your whole system recover more quickly. Personally, I think I'll just drink a glass of milk and a bit of chocolate. It's a bit cheaper, and fun as well! 1. Just because it's poorly written (or bafflegabby in style), doesn't mean it's wrong! When I read the sign, I was very skeptical of the claims. But the sign is right, if somewhat more complicated than need be. 2. Look at multiple articles to see what the consensus is (or the lack of consensus). The "ideal ratio" claim is very much open for dispute. With just a little looking, I could find arguments for every ratio from 1:1 to 10:1... and articles that say "it doesn't matter..."
3. Use Scholar to backtrack to the original article. Strong claims like this (especially those with a scientific sounding backstory) can usually be backtracked to the original author's work in Google Scholar. In this case, it was pretty straightforward. 4. Take note of who supported the original work. It often lets you interpret what's going on in the document. In this case, the study seems to be accurate and well done (although the writeup is slightly biased in favor of the sponsoring organization). 5. More generally, be aware of what incidental learning you're doing--and CHECK when something seems fishy. Even if it checks out, you'll now know you can trust what you would otherwise have just accepted. I hope you enjoyed this background search Challenge. Obviously, if I was going to study this in depth, I would have read more articles in greater depth--but this was a pretty quick way to understand what's going on in this area--and shows how to check out some otherwise difficult to understand claims. P.S. FWIW, I went to the gym today, eager to do a workout and try this magical chocolate milk. But I was too late--it was all gone by 5PM. Ah well, try again tomorrow! SearchResearch Challenge (9/1/16): How do you make sense of obscure technobabble? Not much really irritates me. But one thing that DOES irritate me is when people needlessly make something simple into something that's purposefully obfuscated and hard to understand. This is technobabble at its worst. Why do they write like that? "It offers an ideal 2:1 carbohydrate to protein ratio and includes branched chain amino acids that accelerate recovery." I think I'm a fairly literate person, and yet when I read this, I have no idea if it's true, or just bafflegab. What makes a "2:1 carbohydrate to protein ratio" ideal? Ideal for what? Why does including "branched chain amino acids" accelerate recovery? The thing is, we all see texts like this all the time. We see them in advertising, in op-ed pieces in the news media, we hear people saying stuff that sounds wonderfully technical ("branched chain amino acids") but that we have no way to evaluate it. But of course, SearchResearch readers are not just anyone--we tend to check these things out, we try to dig into the topic and understand what's really going on. This is what reporters, scholars, and people-who-read-critically do all the time. Here's a chance for us to dig behind the scenes and understand the background. I suspect that you'll start seeing examples of signage like this everywhere (now that you're attuned to it). I hope I won't make you continuously irritated by these signs! On the other hand, it's totally possible that this makes complete sense. This is what we want to determine. Is all of this sign true? (And I just didn't have enough background to understand it?) Or is this just plan technobabble? As always, tell us the path you used to figure out the carbs/protein ratio goodness factor, and what you did to understand the relationship between branched amino acids and chocolate milk! P.S. Gentle Readers: This month, (September, 2016) is a time when I'll be in and out of internet connectivity. I know I'll be offline next Monday, so expect my answer next Wednesday or so. The next several weeks will be like this--don't panic--it's just vacation travel in Wifi-free zones.